(Left to right) Rachel Kawall, Malina Kern, Zora Dallmann, and Sora Green. 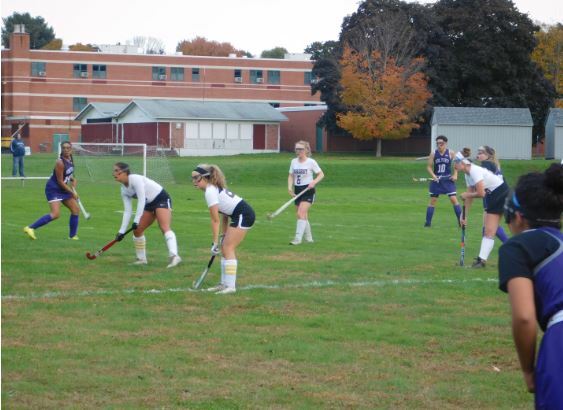 “All the people who don’t play field hockey and say it’s not a sport or whatever, they’re just jealous,” said Jenna Schilling, a member of the JV ARHS field hockey team, embodying the mentality of the field hockey program in Amherst. The varsity field hockey team has lofty goals this year. The first and foremost of these goals is to fulfill their playoffs goals. Last year the ‘Canes were undefeated in their league games and advanced to the first round of playoffs. The ‘Canes have had a difficult schedule this year. In their league, they are completely perfect, except for one loss to Belchertown on October 11. Amherst lost that game. Sora Green called it a “tough game” and Dallmann agreed calling it “a reality check.” However, the Hurricanes have had a positive response. Dallmann said it was an “important game” because “everyone could walk off the field proud of something they did.” The Belchertown game was important for the Hurricanes as they now have won the remainder of their games and qualify for championship contention. Schilling is ecstatic about the varsity level, too. “The higher level of competition and girls on the team” are what galvanized her into practicing hard everyday. Dallmann said it is all about “getting ourselves really pumped up and excited about it. We play the best when we’re happy. We’re narrowing it down to what we need to do.” Dallman’s personal goals include playing “Division III in college,” and she has already “been in contact with the coach at Haverford,” who is “very interested” in Dallmann. As for Green, she shared similar sentiments. “The community that we found on our team this year is special,” said Green. The Hurricanes have found a new identity and with that, a new family.